NZ food writer Allyson Gofton and her husband Warwick relocate their children Jean-Luc & Olive-Rose to rural South-West France for a year. The idea behind the move was to experience a different culture and help the children learn a second language. Allyson has written an honest account of their year and shared the experience in Recipes from my French Kitchen. The resulting book is more than a recipe book – it allows the reader to learn about the lifestyle of rural French villagers from Caixon – a small village nestled beneath the Pyrenees. Each chapter focuses on a month of the year, beginning with December which, of course, is the equivalent of our June and the beginning of winter. A harsh season to begin a new life but the Gofton-Kiely family stuck it out through isolation and loneliness that winter in France brought. I was a little afraid to read this book as I felt it would awaken a slumbering beast within me – living in a foreign county for a year and immersing myself in the food, the people and the customs has long been a dream of mine. Allyson encourages that it isn’t as hard nor as expensive as one might think. For now, I will put my feet up and read about it, then I might cook up some delicious rustic French food – beginning with a Farmhouse Vanilla Pound Cake complete with a vanilla pod sunk into the top of the loaf. As we are heading into some cooler weather – some long-slow baked dinners will be on the menu to fill the house with mouth-watering smells – Slow-baked Pork with Olives or perhaps Lamb Caixon-style. I can close my eyes, breathe deeply and pretend I am in rural France instead of urban coastal New Zealand. 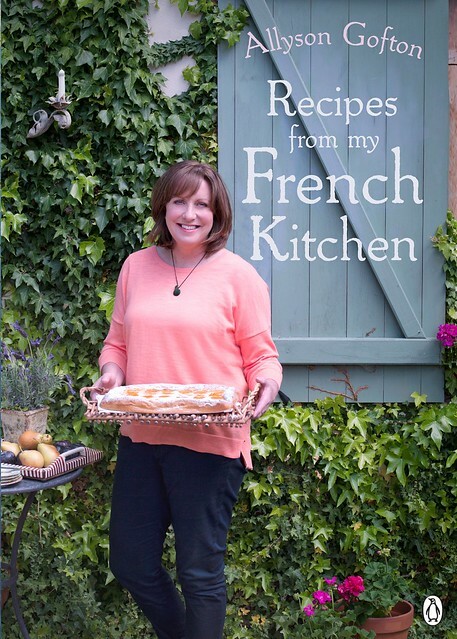 Allyson is currently touring around New Zealand to promote the publication of her book and share her passion for cooking & France. Check out this recipe for Crepes with Pistachio Nut Paste from the publishers website or Allyson’s website for the following recipes: Pascale’s Pear and Almond Clafoutis, French country pork braise, Dijon chicken bake, Potato and lemon grass soup and Chicken Marengo with a twist. The first recipe I have tried is the Pork with Lentils, Ginger and Pears – pork shoulder roasts were on special at the supermarket so I came home with quite a large chunk. I started on the recipe but when I went to pick some Winter Nelis pears from the tree, I discovered only two were edible. The rest the birds had eaten, leaving a stalk and some skin but little else however Allyson mentions that any variety of pear will do. I scouted around in the vegetable bin and found a nashi that had seen better days and a couple of Granny Smith and one Braeburn apple. All set then. The pork was succulent and juicy and the lentils a delicious accompaniment. The pears had held their shape, as had the nashi however the apples had disintegrated into a pile of sweet fluff. AJPML raved over dinner and because I had bought such a large joint of pork, we had enough leftovers to make a second dinner a few nights later. I diced the pork and pears and stirred them into the lentils & gravy. The leftover potato & pea mash was spooned on top then the whole lot baked until the gravy bubbled up around the edges. Yum – we will be having this again (both the original & the left-overs). The other recipe I have sort-of tried is Allyson’s Quick Flaky Pastry. Sort of – in that I made it with wholemeal flour instead of regular flour. And instead of the Fig and Almond Tart featured in the recipe book (as fig season is now finished) I made Chelsea Winter’s (Granny Smith) Apple Pie with Feijoa & Maple. This is a delicious pie that I will be making again – I even went out and bought a pie dish especially so I can make it again (properly this time, not in a loose-bottomed tart tin which leaked juicy sticky pie stuff all over the bottom of my oven). As for the pastry – it was super super easy to make which is excellent as pre-made wholemeal flaky pastry is not something that is very easy to find. There are only two apple recipes in the book and being a French-inspired book, of course one is a Tarte Tatin. The apples Allyson used were Chantecler – not an apple we are familiar with here in New Zealand but her second apple choice is Golden Delicious. When comparing the two apples on orangepippin.com it is understandable as the two apples seem to be very similar. The other apple recipe is foie gras tarts with apple and fig – the apples being Golden Delicious again and the figs in the form of jam. I’m just not too sure about the foie gras….. This entry was posted in Autumn, Book Review, Recipe Review and tagged Allyson Gofton, Caixon, Chantecler, Chelsea Winter's Apple Pie with Feijoa & Maple, Golden Delicious, Penguin NZ, Recipes from my French Kitchen, Wholemeal Flaky Pastry by Jo Dohrman. Bookmark the permalink.